Of all the appliances in your home your water heater may be the most relied upon yet ignored. Unfortunately when this workhorse breaks the consequences can be devastating making it all the more important for you to routinely assess whether you need a Water Heater Repair in Chandler, AZ. Don't wait for the water heater to spring a leak and flood your home or just completely stop, offering you only icy cold showers and wash water. Take the time to examine your water heater now and then every few months. Is it heating water as it should to the temperature you have chosen? If you find yourself turning it up because the water feels more tepid than before you should be concerned. Take a look at the color of the water when you fill a sink or a bathtub. If you notice an odor or an off tint, red like rust or dirty looking gray, this also may be a sign something is off. Review your gas or electric bills to note if you see an increase that may be attributed to the water heater working harder to provide what your household needs. Any of these things can signal that your water heater needs a tune up from your plumber at the very least. Schedule an appointment and have it thoroughly examined. The tank may need a flush and you plumber can show you how this is done, removing deposits that impair water quality and interfere with heating. The heater's thermostat may need adjusting or replacing. Your plumber can also inspect the anode rod and replace it if it is contributing to excess corrosion and mineral deposits. An experienced plumber can also give you professional advice on whether a Water Heater Repair in Chandler, AZ makes sense. 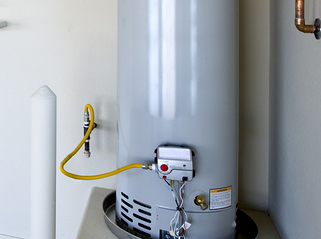 It is often much more cost effective to replace an aging water heater with a newer, much more energy efficient model. Whether you opt to repair or replace congratulate yourself on taking charge of your water heater before a catastrophe developed.